This design has much in common with the entablature of the King's Bedroom, carved 1699-1700. This has a similar modillioned cornice and a frieze with limewood relief carvings of pairs of sporting birds resting on bunches of flowers, leaves and wheat ears and encircled by acanthus whorls. 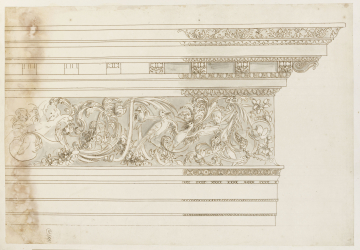 However, Gibbons's design for the frieze is far more complex, both in subject matter and design, and the drawing does not indicate clearly how deep the carved features would be. The drawing implies a relief of considerable depth. On the right, a cupid is in the rear plane of a composition which has acanthus whorls in a middle plane and birds of paradise on a front plane. Yet the relief detail appears to cling to the surface of the frieze and nothing is revealed in section or side view. The design was probably prepared relatively early in the first period of construction, 1689-94, and then used as the basis for the entablature of the King's Bedchamber. The principal simplification in the executed work was the elimination of putti. Other secondary foliage details were also eliminated, and the scrolling pattern of the acanthus was emphasized, making the frieze more readable from a distance. The pattern of staining on the bottom of this drawing closely matches that on the top of 110/62, demonstrating that they were originally very close together or next to each other in the volume but in contrary positions. The design of the frieze is similar to that in Gibbons's drawings for the Queen Mary's Closet (6/7/1 and 2). As a design it is evocative rather than practical, as it is most unlikely that a scheme of this degree of intricacy (with miniature putti within the foliage) it would have been executed as drawn.